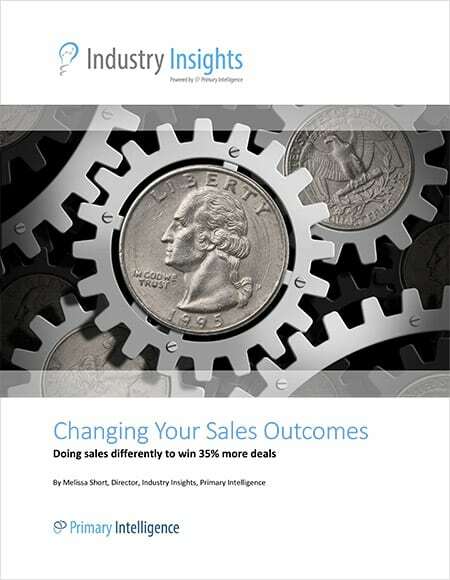 Primary Intelligence helped Plex Systems and its Director of Product Marketing, Dave Morfas, to focus on achieving outcomes with their win-loss strategy. After analyzing customer feedback and attending several discovery sessions (post-sales debriefs), Dave uncovered key factors that presented opportunities for sales and product improvements. Utilizing data-driven insights, he re-evaluated communication channels, bridged a significant gap between teams, and executed a strategic plan to improve results . These actions contributed to a 72 percent improvement in win rates within two years. Dave knew Plex had a tremendous opportunity with the win-loss program to better align Plex to market demands and provide data-driven, strategic insight for the executive team. Additionally, Plex’s sales cycle can be long, so it was imperative to validate the product direction to avoid spending resources while heading down the wrong path. Plex selects a percentage of won and lost opportunities, and those customers provide feedback to Primary Intelligence via an interview. The interviews disclose key factors, major impacts, minor impacts, and competitive intelligence—quantitatively through the survey and then qualitatively through the interview. Then, Dave shares that feedback on a weekly basis and recaps it in a quarterly report as well. The discovery sessions validate or refute what features should be included in the solution to keep Plex aligned to buyer needs, giving the company a competitive advantage. Plex now has much better clarity into their business at very unique and specific points, and tests those in the interview process to understand root causes and best practices for their sales people. This win-loss process allowed Plex to better understand the root causes for losses and develop best practices for winning more deals. With win loss analysis in place and the discovery sessions implemented, patterns emerged on Plex’s competitors, product, and prospects. They learned their strengths, weaknesses, and pitfalls to avoid and can now use their data to achieve their desired outcomes. Dave composes quarterly reports comparing the voice of the customer with the voice of the sales teams. He also works with executives to share the win-loss program findings such as market outlook, win-loss reasons, and competitive intelligence with the Board of Directors. Plex benchmarks their outcomes on their target competitors’ win rate versus Plex’s win rate. They evolved their pricing structure to add flexibility to align to prospect needs. In addition, the win loss analysis program validated Plex’s product investment and cemented a partnership with the sales teams.